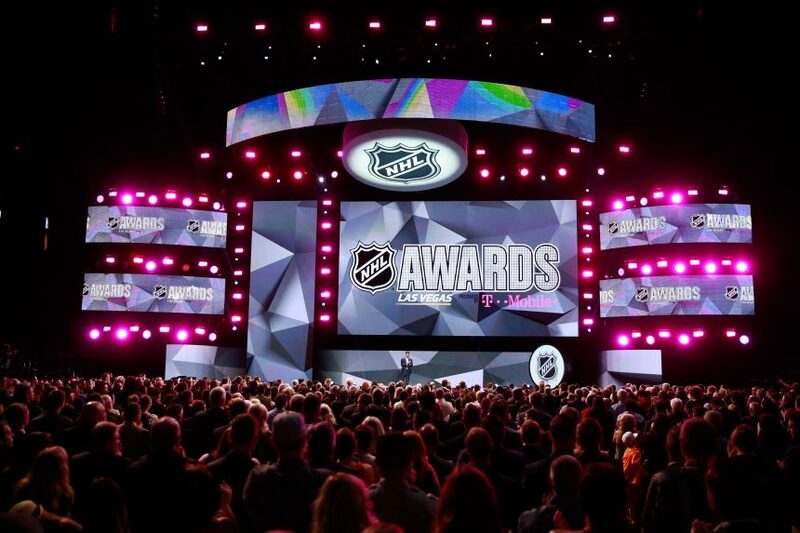 NHL Awards: Quarter Mark - The Point Data-driven hockey storytelling that gets right to the point. We are just past the quarter mark of the season and with no games on the schedule for American Thanksgiving, we thought we’d roll out of award winners from the early stages of the NHL season. Well, this one is a slam dunk. Elias Pettersson is averaging over a point per game and has scored 12 goals in his first 18 NHL games. The Canucks rookie has a rocket for a shot and is tied for 5th among all skaters, rookie or otherwise, in goals per game. Pettersson has 6 more points than the next highest scoring rookie, Colin White, despite playing 4 fewer games. Slam dunk. Blackhawks defenseman, Henri Jokiharju is our runner-up, averaging well over 20 minutes a night through his first 22 games. In fact, only Miro Heiskanen in Dallas is averaging more minutes per game, among rookies. Jokiharju’s is tied for 6th in rookie scoring with 10 points and his 9 even-strength points are the most among rookie defensemen. Brady Tkachuk rounds out the top 3 after posting 10 points in 11 games with the Ottawa Senators. Yes, he’s missed considerable time but he’s still tied for 6th in rookie scoring and is tied for 3rd in goals. Tkachuk has already established himself as one of the biggest net-front threats in the game, leading the league in inner slot shots per game. Freddy Andersen leads the league in wins and he gets out-vote as the NHL’s top goalie of the first quarter. Andersen ranks 5th in goals against average, 3rd in save percentage and when it comes to quality saves, he’s right at the top of the league as well. Andersen has saved the Maple Leafs exactly 1 goal per game compared to league average goaltending when looking at one of our most advanced goalie stats, actual vs expected goals against. This measures expected goals against based on shot volume and quality compared to what the league average is. Andersen’s -1.0 actual vs expected goals against ranks top 5 in the league. Jaroslav Halak has been arguably the best off-season free agent signing in the league. Halak ranks top 3 in goals-against average and save percentage and has the best actual vs expected goals against of any goalie in the league. Simply, Halak has saved his team goals against at a higher rate, relative to league average, than anyone else. What slides him into 2nd on our list is he’s only played 13 games. However, if he keeps it up, he may end up in top spot at the halfway point of the season. Pekka Rinne just keeps winning games. The defending Vezina winner is 9-2-1 with an NHL best 1.64 goals-against average and .944 save percentage. If you think Rinne just sits behind a loaded defense group and bats away perimeter shots, think again. Rinne has saved the Predators 1.2 goals against per game, relative to league average, which ranks 2nd only to Halak. 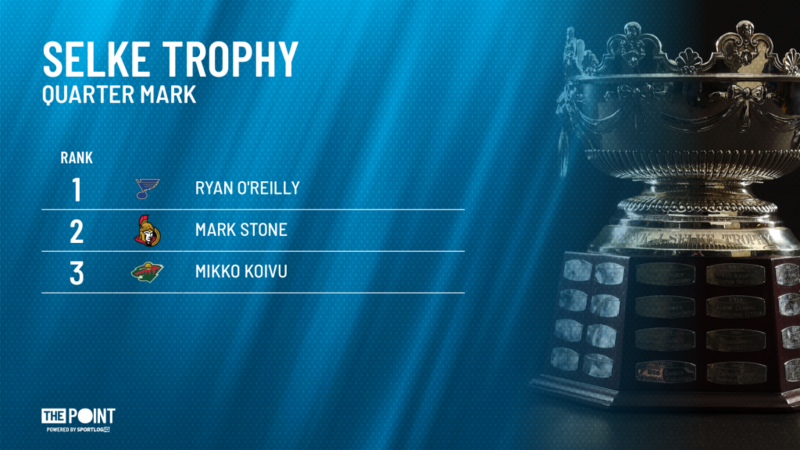 Ryan O’Reilly hasn’t won a Selke trophy yet but he gets our vote at the quarter mark of the season. O’Reilly has been a fixture in all situations for the Blues, leading all St. Louis forwards in total ice-time while ranking 2nd in powerplay and shorthanded ice-time. It’s tricky attempting to quantify how effective players are away from the puck, however, O’Reilly has shown very well in a number of our key performance indicators. Playing all situations, O’Reilly ranks 8th among forwards in takeaways, 7th in blocked passes and 5th in stick checks. O’Reilly continues to be a force in the face-off circle, winning 72% of his defensive zone draws at even-strength and 60% while shorthanded. It’s been well over a decade since a winger won the Selke trophy, which is interesting considering Bob Gainey, a winger, won it the first four years it was awarded. However, Mark Stone is making a strong case to be in contention this season. Stone ranks second in takeaways with 29 and has been on the ice for 58% of high-danger chances at even-strength for the Senators. Stone also breaks up a ton of plays with his stick, ranking 2nd among forwards in blocked passes. Stone doesn’t play shorthanded as much as other guys who will be up for the award and, playing the wing, obviously doesn’t take face-offs. How much that will hurt his chances of winning will be up to the voters at the end of the season. Mikko Koivu is having another terrific season for the Minnesota Wild. 19 points in 21 games, 55% in the circle and impressive defensive metrics, as well. Koivu continues to impact the game defensively at a high-rate, ranking 1st among forwards in blocked passes. At even-strength, Koivu has been on the right side of the high-danger shot count, with his team generating 56% of them while he’s on the ice. At 35-years old, Mark Giordano is putting together a monster season for the Calgary Flames. Giordano ranks top 20 in ice-time among defensemen and leafs all Flames blueliners in powerplay and shorthanded time on ice. Giordano is a big contributor in all 3 zones ranking 5th in scoring among defensemen with 20 points and top 10 in both stick checks and blocked passes. At even-strength, Giordano is comfortably on the right side of the scoring chance and goal differentials while on the ice. 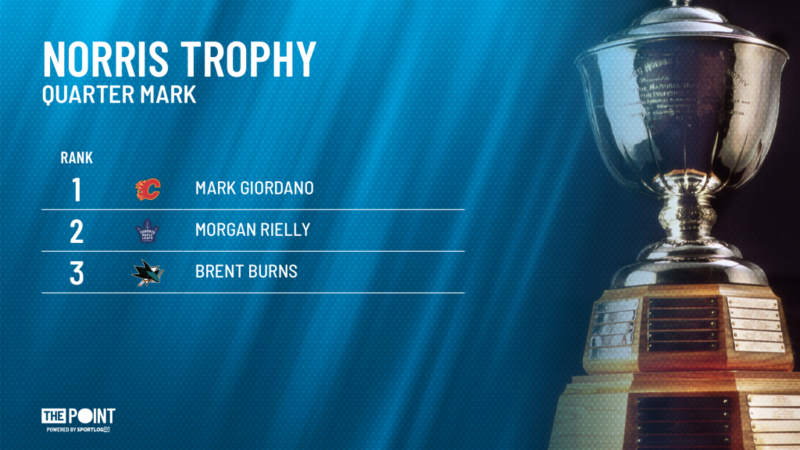 Simply, Giordano checks all the boxes and gets our vote as the quarter mark Norris winner. Morgan Rielly is establishing himself as a legit number 1 defenseman in the NHL. Rielly leads all defensemen in points with 26 and quarterbacks one of the top powerplay units in the league. However, there’s more to winning the Norris than scoring points. Rielly ranks outside the top 40 among defensemen in minutes played and is not one of the Leafs top 4 defensemen on the penalty kill. Giordano’s contributions in all facets of the game is what gave him the edge at this point of the season. Brent Burns continues doing Brent Burns things – impacting the game at a high rate in all areas. Offensively, Burns is 3rd in scoring among defensemen, averaging over a point per game. Defensively, he continues to have one of the most active sticks in the league, ranking 2nd in blocked passes and stick checks. A quarter of the way through the season, the Buffalo Sabres are riding a 7-game win streak and sit 4th place in the NHL. 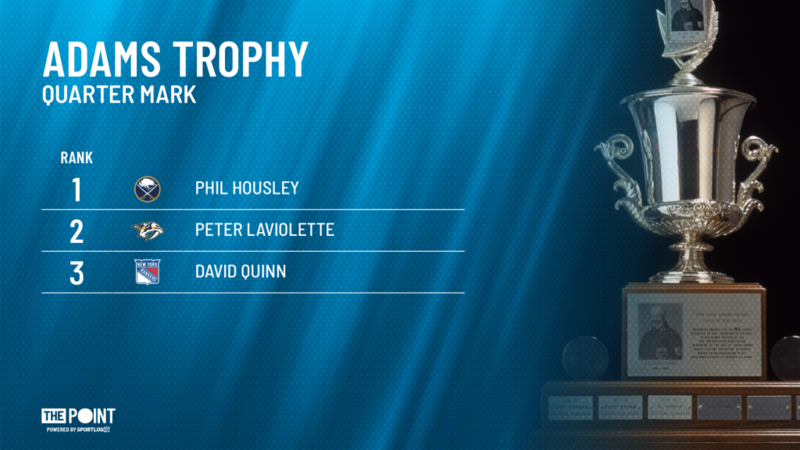 It’s impossible not to give Phil Housley the Jack Adams award at this point. The Sabres were pegged as a team on the rise but I don’t know anyone who thought they’d be a top 5 team in the league at this point. That said, the Sabres have pulled a few rabbits out of their hat during this streak and the odds of Buffalo remaining among the NHL’s elite are slim. We’re still 50/50 on the Sabres making the playoffs but if they do get in, Housley will definitely be front and center in coach of the year discussions. There’s no underdog story in Nashville but you can’t ignore the fact that the Predators are dismantling the rest of the league right now. Peter Laviolette and company are on pace for 59-60 wins, depending if you want to round up or down, which would rank top 3 in NHL history, Kind of hard to ignore that level of success. David Quinn is making quite a splash in his first year behind the Rangers bench. New York has won 3 straight and have 26 points through 22 games, tied with Columbus for most in the Metropolitan division. The Rangers rank in the bottom half of the league in scoring chances for and against so we’re not sure how long they’ll last in a top 3 spot in the Metro, but these are quarter mark awards and Quinn’s work to this point has been worthy of a top 3 selection for coach of the year. 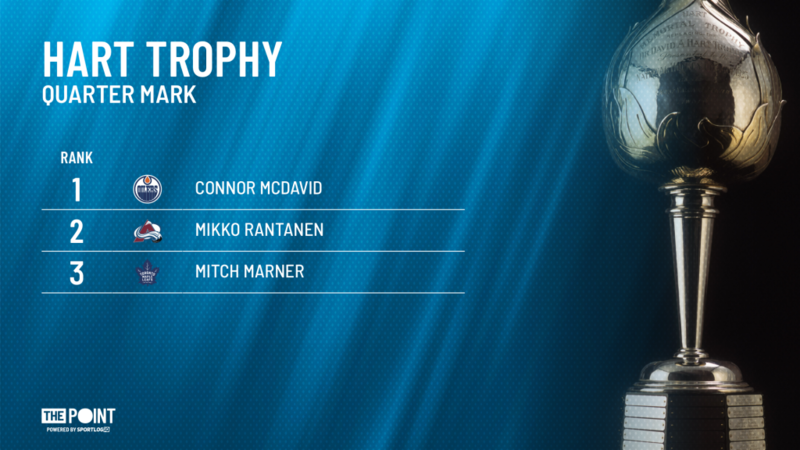 Connor McDavid is the best player in the world and he gets our vote as league MVP at the quarter mark of the season. McDavid is tied for 2nd in scoring, trailing only Mikko Rantanen and is averaging over 22 minutes of ice per night. McDavid has been in on over half of Edmonton’s goals and is on pace to score 121 points, which would shatter the career-high 108 he scored last season. Mikko Rantanen deserves a ton respect and we’re giving it to him. Rantanen is the NHL leader in assists and points and if the NHL Awards were being held today, we’d have him in Las Vegas as a Hart Trophy finalist. Rantanen flies under the radar, playing with a fellow superstar in Nathan MacKinnon but the 22-year old generates a lot of offense for this line. Rantanen is a hard guy to get a body or stick on and has exceptional vision and patience with the puck, which opens up space his linemates. Rounding out our top 3, Mitch Marner. Like Rantanen, Marner is in a contract year and like Rantanen this kid is going to get paaaaaaaid. Marner ranks 2nd to Rantanen in assists with 22 and is the driving force behind the Maple Leafs 7th ranked powerplay. Some people wondered how the Leafs would fare with Auston Matthews on the shelf and thanks, in part, to Marner’s contributions, the Leafs have been able to maintain a top 3 spot in the Atlantic division.